I am not a Mets fan, so I don’t have the emotional weight of 51 years of announcers explicating how my team is one of two teams (now the San Diego Padres stand alone on top of the No No-Hit club) to never have hurled a no-hitter. Sure, the Mets have come close in years past — and with some of the best pitchers of several generations — but last night’s Santana gem will go down in Mets lore. And this is why I love baseball. Baseball, as the cliche goes, is a long season. 162 games that start in the Spring, a time of rebirth, meanders through the sweat-infused Summer, and ends in the Fall, where nights are cool and the dark Winter peeks around the corner. All this is to say that a random game in the upfront of a long season is one people rarely remember. 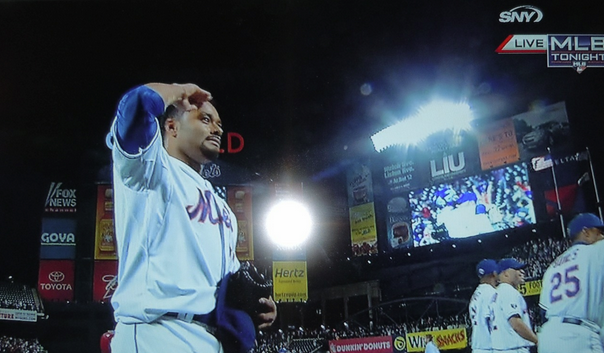 But Mets fans will remember this night for generations. I’ll be telling my kids about the Davids (Cone and Wells) perfect games; Derek Jeter’s 3,000th hit. Sure, I’ll tell my kids about the 1996, ’98, ’99, ’00, ’01, ’09 Yankees teams. But to talk about a random, meaningless game in early June means that the game isn’t meaningless. Baseball, besides being a game of numbers, is a game of stories. It’s history. Other sports have their moments, but how many of them come during the early part of the season? We don’t talk about the random week 3 game in the NFL; we rarely talk about a November NBA game. Yes, part of that has to do with the fact that baseball is a long season. And part of that has to do with the seemingly trivial minutia of a game that’s defined by numbers. But those numbers, they tell stories that bind moms and dads with their kids. So for Mets fans, this June game will be passed on to the next generation as not just a story of numbers, but the story of previous generations. While not the same heft as the Red Sox winning the World Series in 2004 after 86 years of futility, Mets fans stretching back the past half-century have some kind of weight lifted off their shoulders. Welcome to the No-Hit club. Such an incredible streak that has finally ended.